Jay Leno went after NBC again in his monologue Monday, the first since NBC confirmed Jay Leno's show won't be on at 10 p.m.
NEW: Conan: Earthquake so powerful "it knocked Jay Leno's show from 10:00 to 11:35"
Leno: "I leave NBC prime time the same way I found it -- a complete disaster"
Jerry Seinfeld: "Conan has the chance to destroy everybody"
(CNN) -- Jay Leno pulled no punches on his show Monday night, the first since NBC confirmed the TV host was being kicked out of his low-rated 10 p.m. slot after just three months. "Welcome to 'The Jay Leno Show.' As you know, we're not just a show anymore, we are now a collector's item," he said to open the show, before launching into a string of scathing one-liners making not-so-light of the situation. Jeff Gaspin, chairman of NBC Universal Television Entertainment, announced Sunday that the network was taking Leno -- formerly the host of "The Tonight Show" now helmed by Conan O'Brien -- out of the prime-time slot because the show "didn't meet affiliates' needs" despite performing at acceptable levels for the network. The last show will air February 11 to make way for the 2010 Winter Olympics, which airs starting February 12. "NBC said the show performed exactly as they expected it would and then canceled us. Don't confuse this when we were on at late night and performed better than expected and they canceled us. That was totally different," Leno quipped. Gaspin said the plan now is for Leno to host a new, half-hour show at 11:35 p.m. ET, followed by "Tonight" with O'Brien at 12:05 a.m. and Jimmy Fallon's "Late Night" show moving to 1 a.m.
O'Brien had his own zingers for NBC during his monologue Monday night. -- "Good evening, I'm Conan O'Brien, the new host of 'Last Call with Carson Daly.' "
-- "This weekend no one was seriously hurt, but a 6.5 earthquake hit California. The earthquake was so powerful that it knocked Jay Leno's show from 10:00 to 11:35." -- "On the positive side, I have learned a valuable lesson from all this: never sign a contract that ends with the word 'NOT.' "
As of Sunday, NBC was still negotiating with the three hosts over the proposed line-up. "Supposedly we're moving to 11:30. Even this is not for sure. My people are upset. Conan's people are upset. Hey, NBC said it wanted drama at 10:00 -- now they've got it! Everyone's mad," Leno said Monday night. "I take pride in one thing. I leave NBC prime time the same way I found it -- a complete disaster." 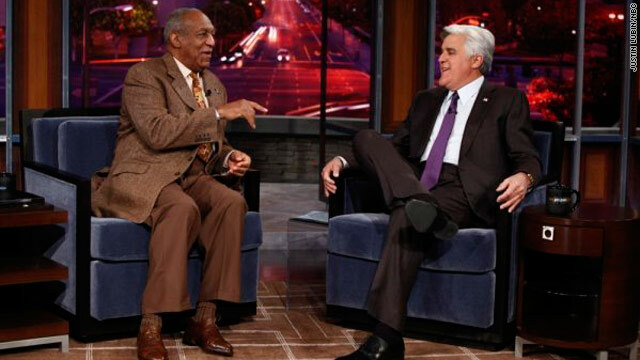 NBC moved Leno to the prime time slot in September with "The Jay Leno Show," a decision that raised eyebrows in the industry. In an unprecedented move, NBC was pitting a talk show up against the hourlong dramas that have typically done well at 10 p.m. Although Leno's ratings were on target with NBC's expectations, the low average of nightly viewers left affiliates feeling the brunt of "the Leno effect," causing the ratings for nightly news to drop. This announcement fueled rumors that O'Brien, who took Leno's spot on "The Tonight Show" in 2009, is considering making an exit. Scott Grogin, a spokesman for Fox, had no comment on whether the network had reached out to offer O'Brien his own show. Fox reportedly went after him six years ago, which led to NBC offering him the "Tonight Show" chair after Leno's eventual departure. "This is still being sorted out," said Ben Grossman, editor in chief of the industry trade publication Broadcasting and Cable, who added that he expects the network to reach a conclusion over the next few days. "The bottom line is that NBC has decided -- correctly or incorrectly -- that they're going to try and keep all their late-night talent. That's very expensive and a very questionable strategy." Grossman thinks it's very likely Leno will remain at 11:30 post-negotiations. "I just don't know that you need to pay that much money in late-night. I think you pick two hosts, one at 11:30 and one at 12:30." Out of the three hosts, O'Brien is the clear loser, Grossman says. Even if O'Brien were to stick it out with NBC, getting bumped back to 12:05 is not optimal, said Christopher Naughton, a 20-year TV veteran and attorney who produces "The American Law Journal." "Pushing it back half an hour is huge," Naughton said. "The later in the night you go, the fewer people that are watching. [That's] going back to a time slot where it's the 'Late Show' again." The whole scenario recalls the precedent set by a similar NBC fiasco 17 years ago, Naughton said, when Leno and David Letterman were dueling over "The Tonight Show." After failing to secure the "The Tonight Show" position succeeding Johnny Carson, "Letterman was able to break out of his contract [with NBC]," Naughton said. "It set legal precedence because they wanted to keep Letterman, but he jumped ship through an escape clause." The effect of that incident has been reverberating through NBC for years, he added. "It's a karmic thing for them," Naughton said. "You would think that NBC would have learned." Jerry Seinfeld, however, doesn't believe people should be shedding tears for O'Brien. "Conan has a chance to destroy everybody," the comedian said while on a press tour for his new show, "The Marriage Ref." "I don't think anyone's done anything to Conan."